Laparoscopic instruments are being used with increasing frequency. Our surgeons recently experienced several independent adverse events involving the laparoscopic linear stapler. Although the Food and Drug Administration maintains a Manufacturer and User Facility Device Experience (MAUDE) database to track such voluntary reports, many events are not reported and the true incidence of adverse events is unknown. 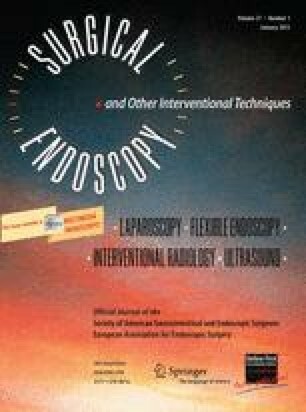 We attempted to determine how frequently minimally invasive surgeons have experienced technical problems with a laparoscopic stapler. Following IRB approval, we electronically distributed an anonymous 10-question survey to the 124 minimally invasive program directors listed in the Fellowship Council database. The questions focused on personal or peer experience with laparoscopic stapler malfunction, frequency and type of malfunction, device manufacturer, whether the operation was altered, and root cause analysis of the event. Forty-four of the 124 program directors (35 %) completed the survey. The majority reported personal or peer experience (86 %) with a linear stapler not releasing (66 %) or not firing (73 %) after application, with 27 % of the respondents noting that this occurred three or more times. The malfunction was not related to type of load, straight (23 %) or reticulating (32 %) model, or manufacturer (Ethicon 30 %, Covidien 36 %). One quarter of the respondents noted that the malfunction caused them to significantly alter their operative procedure, and 30 % reported that they received no helpful feedback from the manufacturer despite contacting it. Most minimally invasive surgeons have experienced laparoscopic linear stapler malfunction and 25 % have had to significantly alter the planned operative procedure due to the malfunction. Presented at the SAGES 2012 Annual Meeting, San Diego, CA, March 7–10, 2012. Drs. Kwazneski, Six, and Stahlfeld have no conflicts of interest or financial ties to disclose.